Fancy a night of jazz? Whether you’re a mega fan of the genre or it’s your first time experiencing the sound of the blues, you’re in for a real treat as London is home to some of the most renowned jazz clubs in the world. First up we have one of the most recognisable jazz bars in London, the legendary Ronnie Scott’s. Not only is it the most recognised but it’s also one of the oldest in the world. On Friday 30 October 1959, saxophonist Ronnie Scott opened the doors to the club and it’s been going strong 7 nights a week since. The club attracts the rising stars of the jazz world and some of the biggest names in the industry. Pre-booking tickets online is advised as people come from all over the world for a night at Ronnie Scott’s. The 606 Club has been around for 40 years and is located in Chelsea. Originally it was a small 30 seater basement club but due to popularity it outgrew its capacity and moved to a new location at 90 Lots Road. The club is owned by musician Steve Rubie who actually started working in the kitchen of the club whilst studying at University. You will however only find British based musicians at the club which is a long running tradition due to the popularity of the club amongst musicians. You’re guaranteed to find world class talent every night of the week at The Pheasantry. The venue is also part of the Pizza Express family so you’ll also be able to enjoy some delicious pizza while you’re serenaded with mellow tunes. The Grade II listed building has retained its original Georgian features with its distinctive grand entrance. 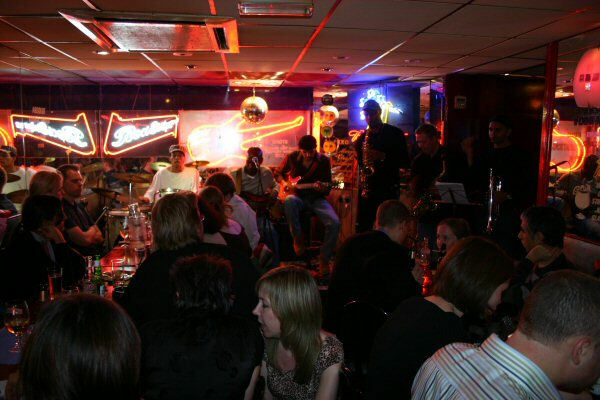 Jazz After Dark is a favourite amongst many well-known established music artists and was also regularly frequented by the late Amy Winehouse. The venue opened in 1985 and its owner Sam Shaker is a talented artist in his own right. The walls of the bar are covered in his own works (the bar is an art gallery by day) which include portraits of many celebrities that have visited the venue over the years. It’s a very intimate venue where blues carries on into the early hours.